Dyes and pigments are substances that impart color to a material. The term colorant is often used for both dyes (also called dyestuffs) and pigments. The major difference between dyes and pigments is solubility (the tendency to dissolve in a liquid, especially water). Dyes are usually soluble—or can be made to be soluble—in water. Once a dye is dissolved in water, the material to be dyed can be immersed in the dye solution. As the material soaks up the dye and dries, it develops a color. If the material then retains that color after being washed, the dye is said to be colorfast. 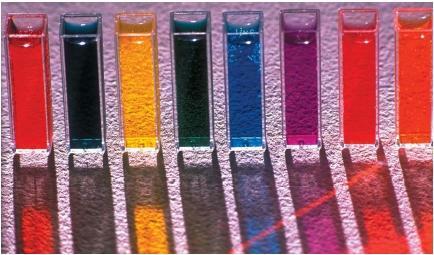 Pigments are generally not soluble in water, oil, or other common solvents. To be applied to a material, they are first ground into a fine powder and thoroughly mixed with some liquid, called the dispersing agent or vehicle. The pigment-dispersing agent mixture is then spread on the material to be colored. As the dispersing agent dries out, the pigment is held in place on the material. In most cases, dyes are used for coloring textiles, paper, and other substances, while pigments are used for coloring paints, inks, cosmetics, and plastics. Many dyes can be obtained from natural sources, such as plants, animals, and minerals. In fact, humans have known about and used natural dyes since the dawn of civilization. Red iron oxide, for example, has long been used to color cloth and pottery and to decorate the human body. Today, T-shirts dyed with naturally occurring red dirt (iron oxide) are popular among tourists on Hawaii's island of Kauai. Red dirt imparts a brilliant orangish-red color to cloth that is almost impossible to wash out. Other natural dyes include sepia, obtained from cuttlefish, and Indian yellow, obtained from the urine of cows that have been force-fed mango leaves. Some natural dyes are expensive to produce, difficult to obtain, or hard to use. Royal purple got its name because it comes only from the tropical murex snail. So many snails were needed to produce even the smallest amount of dye that only royalty could afford to use it. The dye known as indigo, obtained from the Indigofera plant, imparts a beautiful blue color to material, but it is insoluble in water. It must first be converted to a different (reduced) chemical form that is yellow and is soluble in water. In that form, the indigo can be used for dyeing. Once attached to a material and exposed to air, the yellow form of indigo is converted back (oxidized) to its original blue form. A revolution in colorant history occurred in 1856, when English chemist William Henry Perkin (1838–1907) discovered a way to manufacture a dye in the laboratory. That dye, mauve, was produced from materials found in common coal tar. Perkin's discovery showed chemists that dyes and pigments could be produced synthetically (by humans in a lab). It was no longer necessary to search out natural products for use as colorants. Today, the vast majority of dyes and pigments are produced synthetically. These products are easier and less expensive to make than are natural products. In addition, their colors are more consistent from batch to batch than the various samples of natural colorants. Dyes can be applied to materials in a variety of ways. The simplest approach is to dissolve the dye in water and then immerse the material within the dye solution. A person who accidentally stains an item of clothing by spilling red wine on it has actually dyed it, although probably not as intended. Any dye that attaches itself to a material in this way is called a direct dye. The dye sticks to the material by forming chemical bonds that survive even after washing. dyeing process, therefore, involves finding materials to which any given colored compound will attach itself. Mordant dyeing involves the use of a chemical that combines with the dye to form an insoluble compound (meaning it cannot be dissolved). Suppose dye B will not stick directly to fabric A. In order to color fabric A with dye B, a third material—the mordant (M)—will have to be introduced. M will adhere (stick) to both A and B. In the mordant process, the mordant is first applied to the fabric. After the mordant has dried, the dye is added. The dye sticks to the mordant, and the fabric is able to take on the color of the dye, forming an insoluble bond. Pigments are applied to a surface as a mixture that always consists of at least two parts (the pigment itself and the vehicle) and usually many more components. For example, a thinner such as turpentine is often added to a given mixture to make it easier to apply. One of the simplest paints that you imagine, then, might consist of red iron oxide, linseed oil (the vehicle), and turpentine (the thinner). After the pigment/vehicle/thinner mixture has been applied to a surface, two changes occur. First, the thinner evaporates leaving the pigment/vehicle mixture evenly spread on the surface. Next, the vehicle slowly undergoes a chemical change (oxidation) that converts it from a thick liquid to a solid. Since the pigment particles are trapped in the hardened vehicle, a thin, tough skin of colored material becomes attached to the surface. Nearly every industry uses colorants in one way or another. About 7,000 different dyes and pigments exist and new ones are patented every year. Dyes are used extensively in the textile (fabric used in clothing) industry and paper industry. Leather and wood are colored with dyes. Food is often colored with natural dyes or with synthetic dyes that have been approved by a federal agency (proven safe for human consumption). Petroleum-based products such as waxes, lubricating oils, polishes, and gasoline are colored with dyes. Dyes are also used to stain biological samples, fur, and hair. And special dyes are added to photographic emulsions for color photographs. Plastics, resins, and rubber products are usually colored by pigments. I just want to say that this website is very helpful to me while doing a science experiment. THANX!! i just wanna say big thanks to this web.. it really helps me while i am doing my coursework!! this web is very helpful for me.by this web i complete my Assigment and get good number in my assigment it also provide me alot of knowledge. Nice work! the most lovely thing about this material is that it is what some one want to know i mean its to the point and without any unwanted length. This is a very helpful website for myh lab experiment on pigments and colored dye! this was so help full thank u and keep on writting w'll keep on reading thank u againg. this helped me a lot when i did my science project!!! This info helped me a lot..thanks for great info i was looking for the info on pigments and got it here. how much time required for Pigment dyeing ? is it required same time ( i.e- 8~10 Hrs/batch) like reactive dyeing ? is the Pigment dyeing time vary for Light , Medium & Dark color ? pls help me to get all the answers . thanks .